While exploring, you stumble upon some strange glyphs–hints at how the ancient temple of Menara once looked. You see some building materials nearby and decide to reconstruct it–what could it hurt? Little did you know that the materials are cursed, and if you cannot build exactly according to the plan, your resulting structure will have to reach higher and higher. You really should know better by now than to touch strange ruins while you’re exploring. Now you must trust to your wits and your dexterity if you ever hope to win. 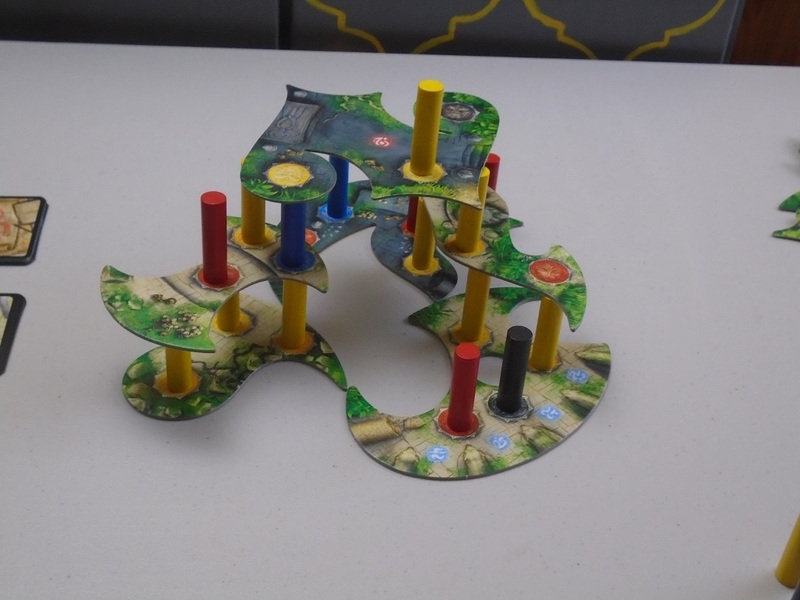 Menara is a cooperative stacking dexterity game for one to four players. Players must complete tasks to build the temple of Menara. If the temple has as many levels as it needs to when the game ends, the players win. Menara set up for one player. To begin, each player draws a number of wooden pillars from the bag dependent on the number of players. The camp is filled with pillars, the task cards are separated by difficulty and shuffled, and the floor tiles are shuffled. The top three floor tiles are placed in the center of the table so that they touch at two points. The initial level cards (which determine how high the structure must be at the end of the game) are laid out. Play begins. Each turn follows a few steps. First, a player may swap any pillars in their area with pillars from the camp. Next, the player draws a task card from one of the stacks. Tasks can be placing pillars or moving pillars higher in the structure. The difficulty comes in how many pillars have to be placed and where they must be placed. (Some cards allow total freedom in placing pillars; others require the players to place multiple pillars on the same floor tile.) Pillars must always match the color of the space where they are placed. 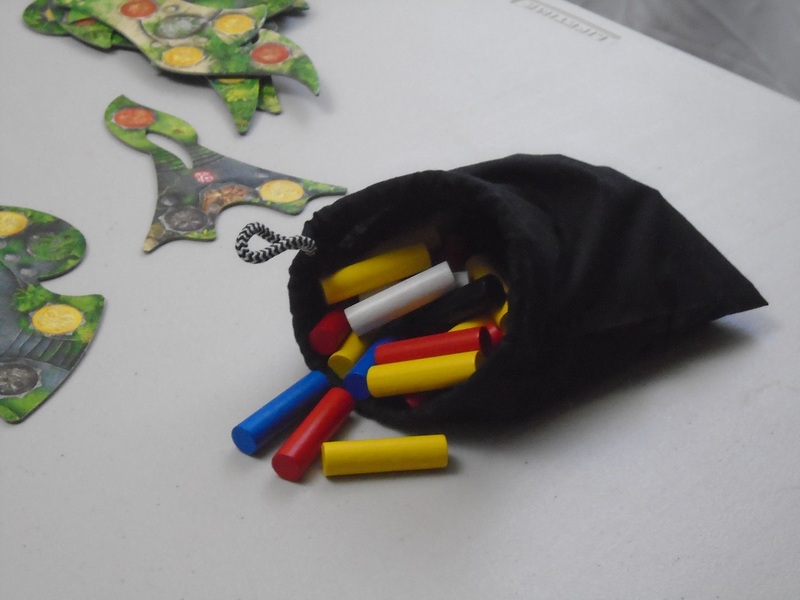 After the task is completed, the player refills their area with pillars from the bag. This page in the rulebook is a handy aid to show which task cards are in which decks. If for any reason a player cannot complete the task on the card, the card is placed face down as another level that the players must complete in order to win the game. The game ends when either the last floor tile is placed, a player can’t fully refill with pillars from the bag, the last task card is completed, or if a floor tile ever collapses. If the structure has as many or more levels as required, the players win. If not, the players lose. A Spoonful of Sugar, or a Bitter Pillar to Swallow? I love stacking games, usually because it’s satisfying to see whatever is being stacked get taller and taller and balance in stranger and stranger ways. But that’s the best part of stacking games–seeing what results–so it’s a little strange that most stacking games are competitive, where the desire to see a structure grow is competing with the hope that another player knocks it down. This is part of why Menara is so brilliant. The other part of why Menara is so brilliant is…well, everything else. The temple base consists of the top three floors of the shuffled floor stack. I’ll start off by saying that Menara is hard, and it’s hard for a few reasons. First, it’s hard because the dexterity challenge is a tough one. Players have to balance pillars on strangely shaped floors, and as the structure grows and becomes more unruly, this becomes harder and harder, especially as players have to push their structure upward in order to have any chance of winning. The camp allows players to exchange pillars in order to get the colors they need to complete tasks. But Menara is also difficult because in addition to being a dexterity challenge, it’s also a resource management challenge. Players have to carefully manage their pillars in order to have on hand the ones they need to complete the tasks they draw from the deck. 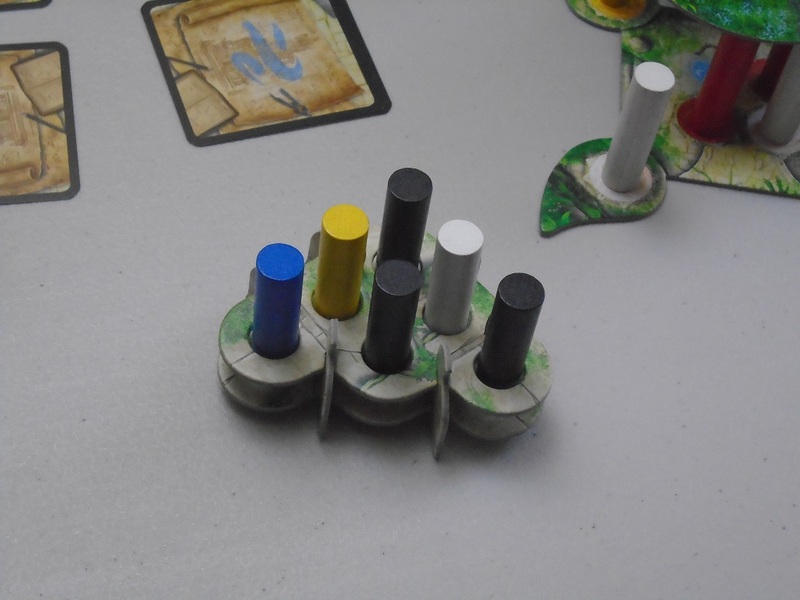 But they also have to look at the pillars the other players have in order to set them up for their turns. 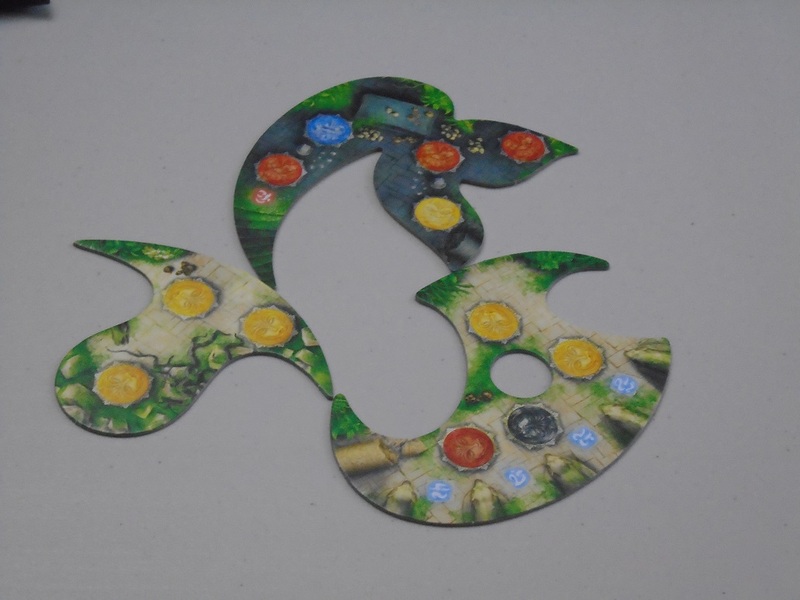 Because any incomplete challenge is another level they have to build for the end of the game, players have to be ready for whichever task cards they might draw. Early on in a solitaire game of Menara. I like that the game has this element of risk–which task card will you draw?–because it makes every turn exciting. Every turn, you have to try to swap the right pillars into your stock so that you’ll be well equipped to meet any challenge, but it’s usually not possible to be able to meet every condition on every turn. You do your best to be prepared and hope you don’t draw the wrong card. I recognize that some players will probably see this and cry, “Luck!” and run away. But since the composition of the deck is known, I would more call this “risk,” which is entirely appropriate in a dexterity game where placing every piece on the structure is already precarious. Much like epidemic and city cards in Pandemic, you usually have some inkling of what’s coming; it is up to players how to manage the unknown with what they know. There is the additional wrinkle of floor tiles. The floor tiles in Menara are various shapes and sizes, and many of them have inconvenient cutouts in them that are just the right size to accommodate a pillar rather than sitting on top of it. You have to be careful when you complete a floor tile because then you have to place a new one, and there may not be a great place to put it. So in addition to managing resources, players have to manage their timing–you don’t want to add a shaky floor tile to the structure; at the same time, if you can’t do that, you have to make the base wider, which means your goalpost moves again. Each floor tile is also double-sided–one “day” side and one “night” side. The difference between them is the pillar requirements for the floor and also where the different pillars must be placed. The pillars in the bag have different rarities, so placing a floor is often strategic–which pillars does the group have available that might be able to complete the floor? Or which ones might they draw? Of course, sometimes which side of a floor tile to place is dictated to the players–you place a new floor based on the task card drawn. Some cards require the daytime side, some the nighttime side, and some let you choose. If you haven’t guessed from what I’ve already written, I love Menara. I think it’s a sharp, clever design that channels players into difficult dexterity challenges through the task cards while also giving them enough flexibility to feel creative in building the structure. Many dexterity games allow players some measure of “chickening out” of the hardest challenges, but in Menara, there’s really nowhere to hide. The more you refuse to do tasks, the higher your structure must be to win. Thus, the game is legitimately challenging (and you can even up the challenge by increasing the starting requirements for floors and reducing the number of pillars each player has in their stock). The mid game of my solitaire game of Menara. The structure is getting…taller. 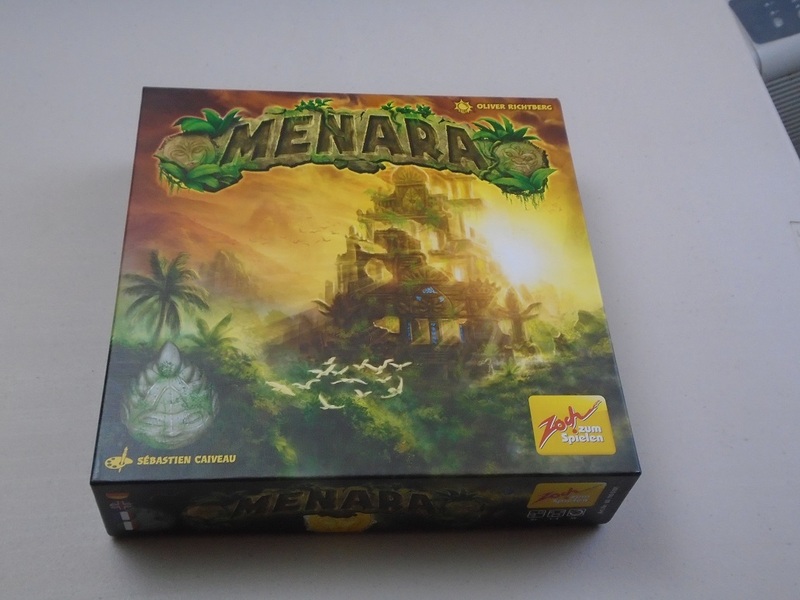 You may also notice, however, that Menara has more rules than stacking games like Jenga, Rhino Hero, or Animal Upon Animal. 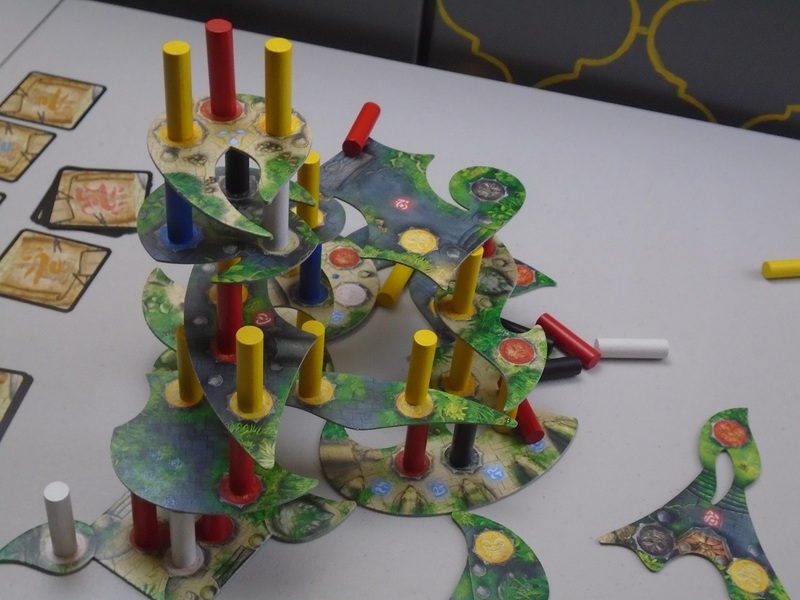 Menara is a stacking dexterity game informed by Euro game sensibilities. To me, a lover of both genres, this is a fantastic combination. To others–primarily those who are more casual gamers who aren’t interested in reading rulebooks–this may seem like too much. Indeed, I find Flick ‘Em Up needlessly complex; it’s possible for a dexterity game to exceed its reach. And the Menara rulebook does have some ambiguities that require either taking to the forums or making a quick ruling during play. That being said, I don’t think Menara exceeds its reach. 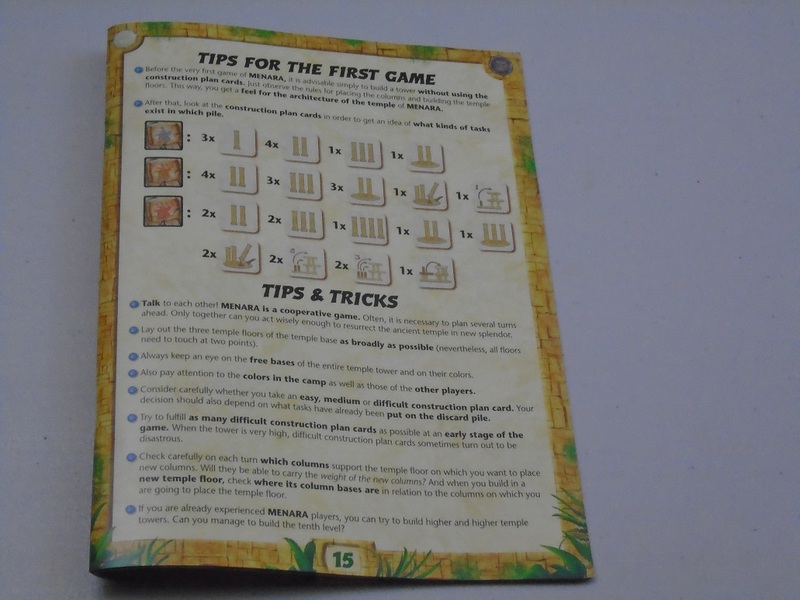 The rules may seem complicated at first, and they may seem like a lot when you’re looking at the rulebook, but I think they help to focus the tension of the game. The pillar draw bag in Menara is too small for the start of the game, when all the pillars are inside. It gets better as the game goes along. 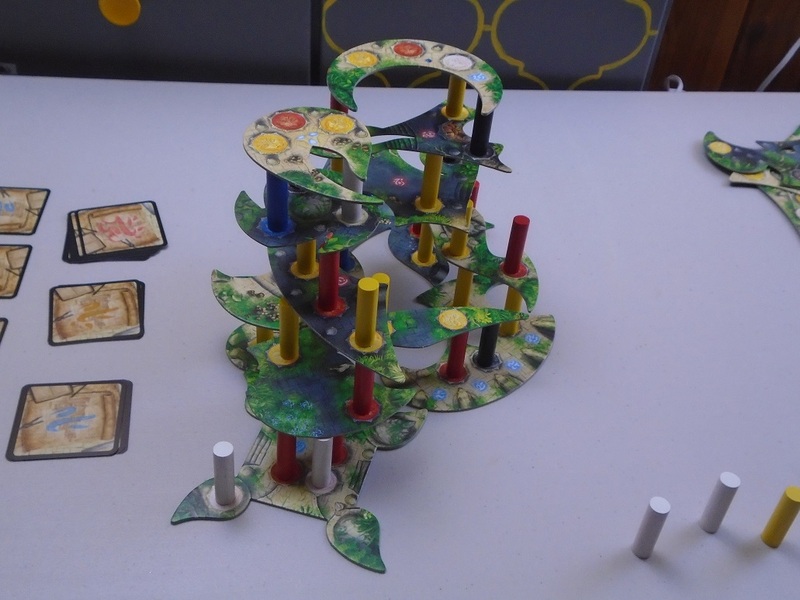 The components in Menara are mostly excellent. The wooden pillars are well painted, and the colors should stand out. (I haven’t played with colorblind players, but the pillars seem very distinct from one another, higher contrast than the usual “Euro” colors.) The floor tiles, as I said, are strange shapes, and they give the game character and increase the challenge (and offer replayability: the order in which the floor tiles are drawn is very important). They also give the game amazing table presence. Even though these are cardboard (unlike the wooden floors in the similar-looking Villa Paletti), they are sturdy. The effect is beautiful both while you’re playing and at the end. The task cards are a little thin, but they get the job done, and the iconography is clear. The camp is constructed from punched-out cardboard pieces, and while it was a pain to fit together, once together, I don’t know if I could take it apart if I wanted to. 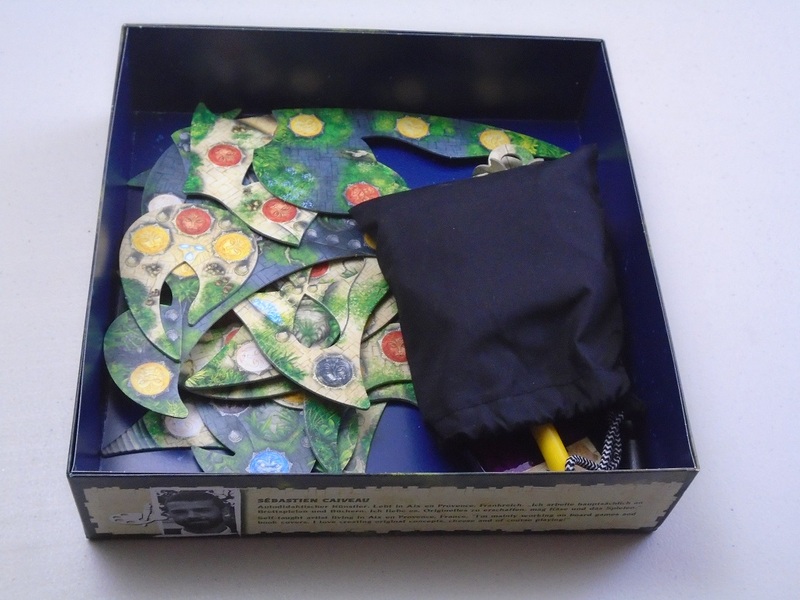 My only gripe–and this is common across most games that include draw bags–is that the draw bag is only just big enough to accommodate the pillars for the game, which means it isn’t quite big enough to mix the pillars before drawing. As the game goes on and the bag empties its contents, obviously usability improves. I just wish the game had come with a larger draw bag. (I will likely replace this in my copy.) I also could wish that the game came in a smaller box, but this is my gripe with most games, and I think the fun of the game justifies the space it takes up. Alas! My solitaire game ended in failure. The box says the game plays 1-4 players, and this seems accurate. Because this is a cooperative challenge and the game itself provides the goal, solitaire play is possible because even the multiplayer game is the same task distributed among players. And this is interesting enough as a solitaire game, even if I wouldn’t always choose to play it that way. As a solitaire game, it bears a certain resemblance to playing with Legos or building with blocks: it will occupy your mind and be engrossing, but there are better solo games available if strategy is your chief concern. With others, the game is a nice challenge, and while there is always the possibility of one player taking over the strategic decisions–“Swap these pillars, draw from this stack”–it’s still up to the player whose turn it is to perform the task on the card, so I think quarterbacking concerns should be at a minimum. The game is longer than your typical dexterity “snack” (where the structure is bound to topple in five to ten minutes), so it’s not exactly a filler game, but Menara has the decision space to justify the added playtime, and the resulting structure is interesting enough that the task is engrossing as you play. I haven’t been at all bored during my plays. We won this three-player game–just barely. 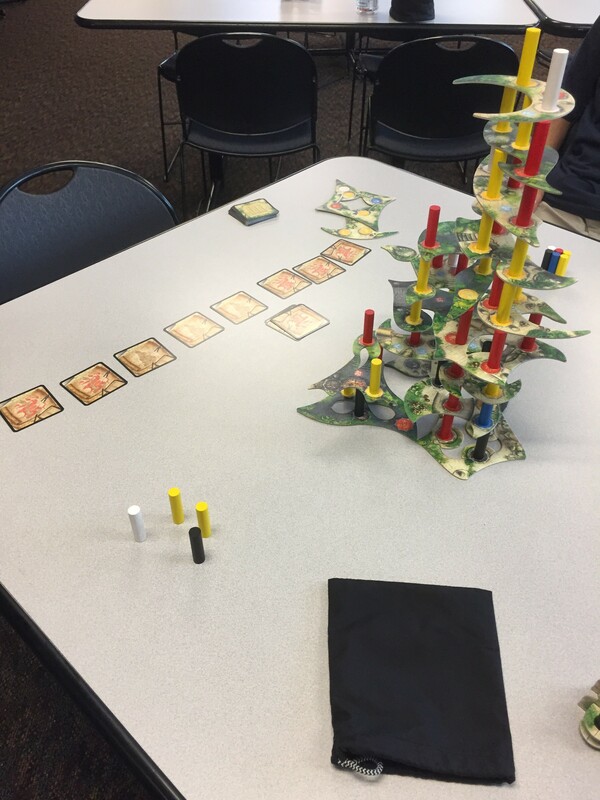 I played with coworkers at lunchtime, and as you can see, the table presence is real. I hadn’t heard much about Menara when I received my copy in the mail, so this was a delightful surprise for me. I like dexterity games anyway, but the added strategic challenges really elevate (!) this one above the competition. Because of the strategic decisions inherent in the game, there are probably better dexterity choices if your chief play group includes children (see the aforementioned Animal Upon Animal or Rhino Hero), but I’m hard pressed to think of a better one for grown-ups, at least if you’re interested in a nigh perfect marriage of dexterity skill and strategy. 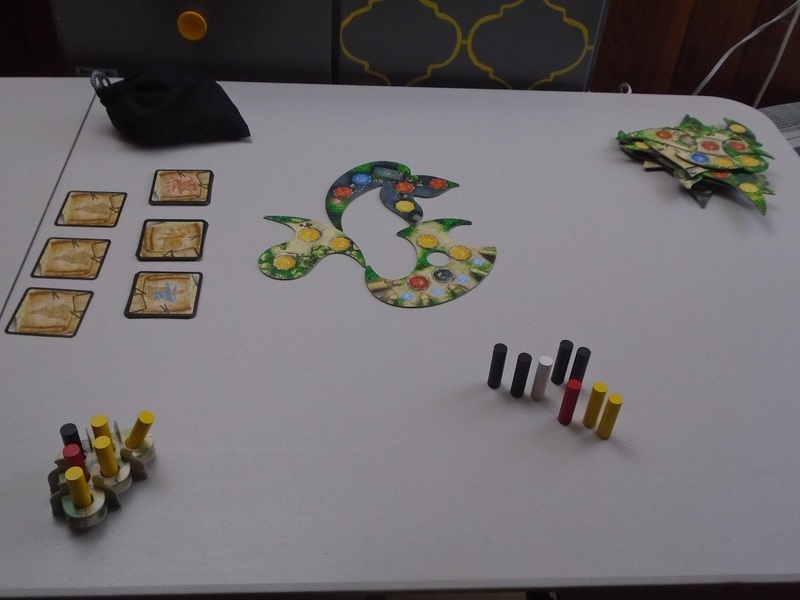 iSlaytheDragon would like to thank Lion Rampant Imports for providing us with a copy of Menara for this review. Next Article Review: King of Tokyo: Power Up!